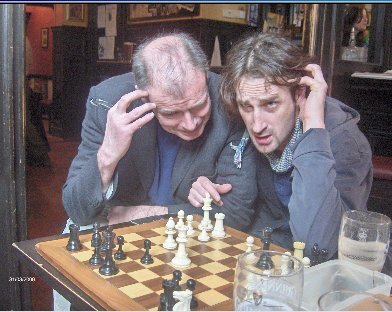 geoffspare@hotmail.com I'll send it on in Chess Base and pgn format. 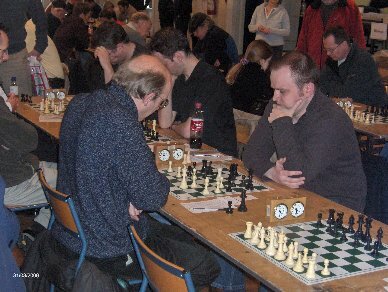 The tournament report on the main site at Chess Edinburgh. I picked up £50 for the under 2100 grading prize. Did I say 'picked?' Nicked would have been a better word. I took a Friday night bye to put a ½ point on the board. On the Saturday morning I walked into a trap v Joe Redpath. I'm black and lost. I played 34...Rd3? 35 Bh6+ 1-0.
that game in a later C.C. position. I kept plugging away and suddenly my opponent blundered. 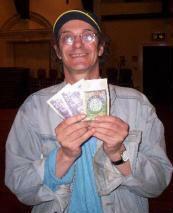 I won and Alam Tate lost to Colin McNab I get £50. Enough of me. Here are some more interesting things. appearing in The Scotsman but will be printed before I post this. Eddie Perry had a fascinating struggle with Daniel Gormally in round 1. Infact in this position he could have drawn with 42...Bxb2. a very nasty and winning discovered check. But 43...Qg6 holds. Dougie Bryson was in the running for the swindle prize. just played 29 f5? Qxg2! 30 Kxg2 Nf4+ 0-1.
not awarding the best game to a prize winner then this may have won. A scene from the Challengers courtesy of Derek Ward. had found 23 Rd5!! (stopping 23...Qxd6+) 23...exd5 26 Qg7!! Then it would have walked the Brilliancy prize. The Swindle Prize was won by Jake Adams in the Bishops. I was playing out J. Adams v B. O'Donnell. "Aw this boring Geoff, get on with another game." was only a few moves left. Black to move played 23...Rb8? 24 Nc7 mate. The whole pub collapsed in unkind cruel and helpless laughter. "That's it bayed the crowd, nothing can top that." and NOT him would win the £10 he tried to withdraw it. White played 1 Rxh3+ draw. (1...Kxh3 stalemate). The grading difference was 827 points. Black won the Giant Killers Prize £30. It was a long hard game and white was better for most of the game. towards an opposite coloured Bishop draw white miscalculates. Giving us this final drawn position. And finally. Instructive Game No. 136.
openings where he appears to do nothing and then suddenly strikes. pawn protection. He sets off a long combination starting with 14...b5. up his sleeve 18 N2g3. He missed the real target, the Bishop on e3. Black wins a pawn. That is all he needs. Hamilton McMillan was the player I beat in Round 4. He was a perfect gent even though I had swindled him. much as he congratulated me. It really made me feel good. manager and get him to put up a mate whilst drunk prize. One of these two will win it.